Though it's been raining most nights since last weekend, the weather is unusually hot during the day. My cats are feeling the heat too and I see them lounging around in the oddest places to cool down. That's why I'm contemplating on getting a new fan for our living-room. Our single ceiling fan is no longer sufficient to keep my fluffy kids happy and comfy and I'm sure they will welcome another fan in our living-room, which is huge by the way. 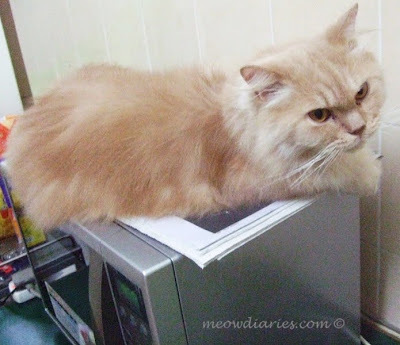 Get off the microwave oven Benji! The Mika Aire Concept II ceiling fan is a best-seller for Minka Aire. It's available in a 44" and 52" model with 3 concave blades set at a 14° pitch to offer efficient air distribution. I'd have to get the contractor to install the new fan but if it will take away some of the heat we're currently facing, it's worth the money. Plus, this fan is easy to set up; requiring 75% less time and labor to assemble compared to the conventional ceiling fans. Available in white, brushed nickel, maple, mahogany, and oil rubbed bronze, this fan comes with a remote control, which is perfect for lazy me. All Minka fans also come with a 110% Low Price Guarantee! love Pheeb's tongue.. and they also sleep on applicances eh GP? 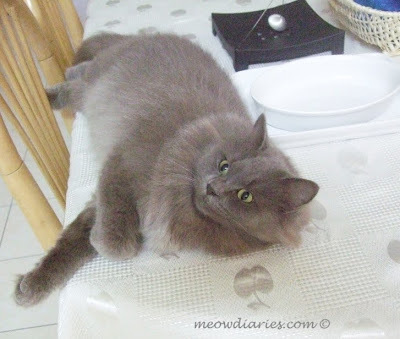 He he my cats oso feeling the heat GG, so hot nowadays! Meow! I agree cats are clever! No sleep GG, he eh he! Why wan to sleep so early lol!! i need a new fan also marzie.. i look like phoebe too kalau dah panas... just much much less cuter! LOL! :-P :-P :-P :-P :-P BM! WOW shower thrice a day….must be damn hot that time GG! How come GG??? How did ur kitty die?? Old age is it? Oh no….hugsy! =-O =-O =-O =-O =-O u haven't had dinner yet?!?! still looking for some dresses online and pairs of shoes..heheh! I haven had dinner yet cause I woke up so late GG!!! Shopping tonight GG, wah $$$$$!! No GG going out to buy later he he, wah I wan pizza!!!! Extra cheese pls! Extra cheese is a must for pizza! Stop by and take the "Cat or Meatloaf?" quiz I made. It's super cute! 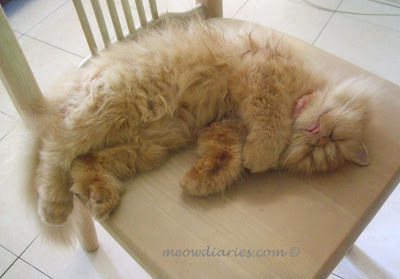 Recent blog:=- Two Cats Tuesday: Pop Quiz... Cat or Meatloaf? Kenet is a girl doggie? Maybe can show her pic or have I seen it at ur blog before? ?